I love leftovers and coming up with new ways to re-purpose them! Easter was a few days ago and we had a good amount of ham leftover, along with the ham bone. I’ve used the leftovers in a few ways, including my last post (Fettuccine Primavera with Goat Cheese Sauce and Leftover Easter Ham) as well as making homemade ham stock and using leftover cubed ham for tonight’s elegant Tuscan bean soup. Serve with crusty bread and a glass of crisp white wine and not only will you have a winning homemade supper that you can be proud of, you’ll feel resourceful having used up every possible bit of that leftover Easter ham! To make stock with leftover ham bone: Clean the bone of the ham meat as much as you can and store meat in the fridge until later. Place the ham bone in a large soup pot and cover with water. Add half an onion, handful of baby carrots and a couple of celery stalks with leaves. Cover with a lid and bring to a boil over medium-high heat and cook for 2 hours (turn down to a simmer once boiling). Strain the broth and keep warm back in the pot if using that day, or cool down and store in the fridge if you’re using it another day. When the bone is cool enough to handle, pick off any usable meat and set aside if using right away, or store in the fridge if using later. I made the stock the day before to save myself time. If you don’t have a ham bone, use chicken or vegetable stock instead and skip this step altogether. In another large soup pot, heat the olive oil over medium heat. Saute the onion, celery, carrot and garlic for 3 to 4 minutes. Season with red pepper flakes, salt and black pepper, to taste. Add the diced tomatoes, both beans, and 8 cups of ham stock (or chicken or vegetable stock). If you’re using ham stock, make sure to pour through a strainer as you add to the pan to catch any fat. Next add the herbs and cheese rind. 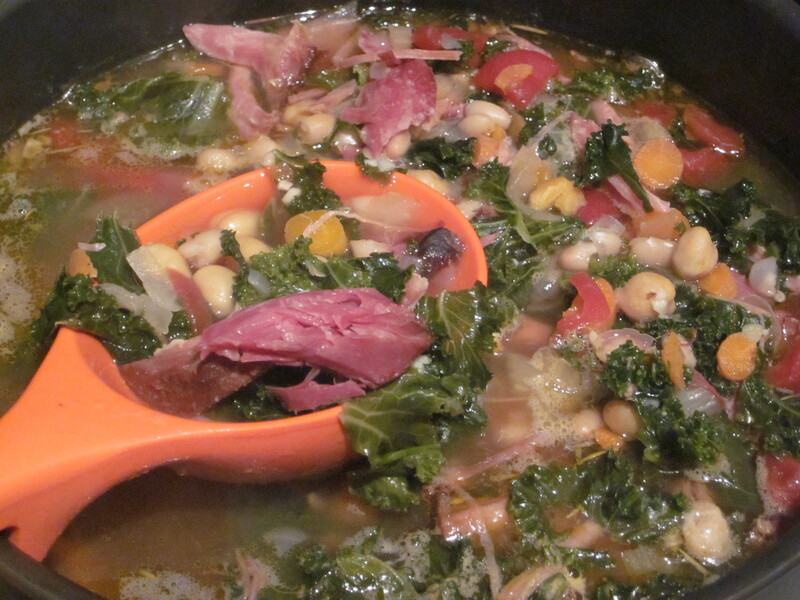 Cook for 20 minutes, then add the chopped kale and chopped ham. Continue cooking until the beans are completely tender. Remove and discard the bay leaf and cheese rind. Season with salt and pepper to taste. Serve the soup in large bowls with grated parmesan and crusty bread. I’m singing along to Dean Martin’s ‘That’s Amore’ as I write this….”When the stars make you drool, joos-ta like pasta fazool, that’s amore”! 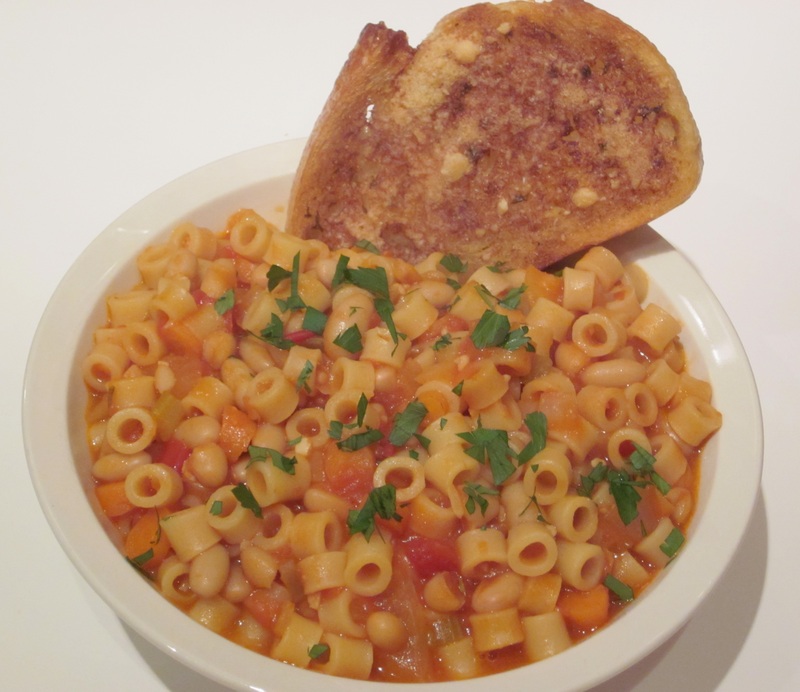 Pasta Fazool or Pasta Fagioli, meaning “pasta and beans”, is a classic and traditional Italian soup or soup-like dish (consistency can vary depending on the region). This rendition is a mix of a Rachel Ray recipe, my BF Mom, Dolores’ recipe and a few of This Girl’s tweaks. Pour yourself a glass of vino to enjoy with this comfy meal and mangia! Heat a deep pot over medium high heat and add oil and add herb stems, bay leaf, red pepper flakes, chopped vegetables, and garlic. Season vegetables with salt and pepper. After the veggies have a few minutes to sweat, add beans, tomato sauce, water, and stock to pot and raise heat to high. Bring soup to a rapid boil and add pasta and cheese rind if you have one. Reduce heat to medium and cook soup, stirring occasionally, 6 to 8 minutes or until pasta is cooked to al dente.Cooking the pasta right in the soup will help it thicken. Rosemary and thyme leaves will separate from stems as soup cooks (if you used the fresh herbs). Remove herb stems, bay leaf and cheese rind from soup. Let soup rest and begin to cool for a few minutes, it will also continue to thicken. Ladle soup into bowls and top with lots of grated cheese. Because I used dried herbs, I also garnished with a little chopped parsley to finish with a fresh element. Enjoy with a glass of vino and some toasted up crusty garlic bread for cleaning the bowls!